He is a fine banjo player and as well as giving concerts can teach and give presentations on the history and culture of the instrument. He is well known around the folk scenes of East London and Essex. 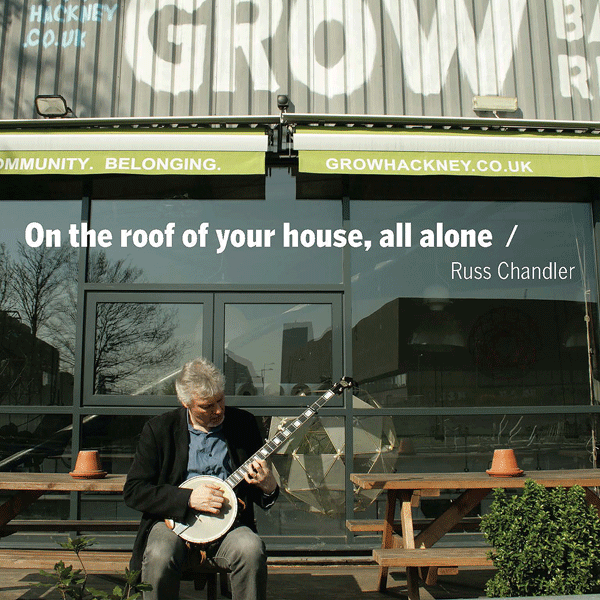 His latest collection On The Roof Of your House, All Alone featuring Matt Quinn, Matthew Crampton, Rachel Weston and Steve White & the Protest Family is available now. In this new collection Russ continues his eclectic choice of material and collaborators to come up with a very distinctive take on folk music. Songs range from a forgotten music Hall Number from the late nineteenth century brought bang up to date in hipster Shoreditch, a song by designer and radical William Morris, one of the most powerful songs of resistance to oppression ever written and some swinging hits from the nineteen thirties. And a sad love song too. I discovered the folk scene in 2003. In those days I played guitar, only taking up the banjo a couple of years later. I loved the songs and not being a songwriter started arranging songs in order to bring them to a new audience. I play all sorts of things from modern contemporary songwriters to very old traditional songs. I’m particularly interested in the Music Hall; discovering and arranging the old songs so they can connect with a modern audience. I also play Classic finger-style banjo, and won the George A Keeler Memorial Trophy for finger-style banjo playing in 2012. In addition to my solo work I am a member of Steve White & the Protest Family – east London’s favourite semi-acoustic singalong political folk punk group! I am also promoter and one of the driving forces behind the Walthamstow Folk Club. This page is a collection of my recordings and videos, plus a place for me to share some of the other bits and pieces I have come up with. There is sheet music I have found, essays and other ephemera that may be of interest to someone. Later I will be adding some interviews too. I would love to make this site a portal for the sort of material that interests me so if you have any ideas for articles or would like to contribute please let me know – you can contact me here. Thanks to Theo Michael, Guy Smallman and others for the photographs.